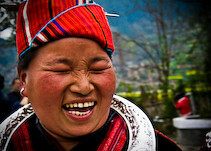 Like the Mountain Ramp Festival, the Sister Meal Festival (also called the “Sisters” or “Sister Rice Festival”) is a way for young Miao men and women to match up for marriage. Although exact dates and customs vary between towns and village in Guizhou Province, the festival commonly occurs in the Spring on the fifteenth day of the third lunar month. Activities such as bullfighting, singing, dancing, and drinking rice wine make the festival increasingly popular with tourists in Southwest China. In Taijiang County, Guizhou Province, the Sister Meal Festival happens every spring. This is a day for all young boys, girls, and relatives to stay together. In this old festival, married ladies come back to their parents’ home to sing and to dance. Boys and girls celebrate together and find their beloved one in the party. Their costumes are different from those who attend the Mountain Ramp Festival. Red, purple, and blue are the main colors on their clothing. Various patterns and embroidery styles appear on their costumes, e.g. dragons, phoenixes, birds, and flowers. The silver objects worn by the Miao ladies are for decoration and also for exorcising evil spirits. Middle-age ladies have a piece of white thread on their head to represent the river along their village. Miao people have amazing costumes and beautiful voices for singing. They are very passionate and generous. Whenever there are guests, the host serves each of them with homemade rice wine, bowl by bowl. If you finish all the wine without any hesitation, you will definitely get drunk in a Miao people’s home.